I have committed the most terrible sin of book bloggers. I finished this book back in October, according to my handy dandy Goodreads account. I took some notes and then I thought I would sit and ruminate. Well, it's four months later and I don't remember this book quite as well as one might hope. That being said, I'm just going to throw out a few things I do remember because you've probably read the book by now anyway! Clay Jannon has lost his job as a designer and media guru for a bagel company. He wanders the streets of San Francisco looking for work when he spots an ad in a window. He enters the store and has his first meeting with Mr. Penumbra, proprietor of Mr. Penumbra’s 24 Hour Bookstore. Clay is hired as the night clerk and settles in for some long, quiet nights. But he quickly realizes that there are only a few popular books and most of the books are unheard of titles borrowed by mysterious regular patrons. What is the real story at this bookstore? 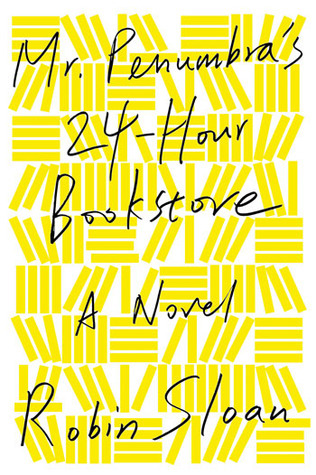 Mr. Penumbra’s 24 Hour Bookstore might best be described as a zany romp. It begins in a place that is familiar to many of us – a dark, dusty, second-hand bookstore. “The shelves were packed close together, and it felt like I was standing at the border of a forest – not a friendly California forest either, but an old Transylvanian forest, a forest full of wolves and witches and dagger-wielding bandits all waiting just beyond moonlight’s reach. There were ladders that clung to the shelves and rolled side to side. Usually those seem charming, but here, stretching up into the gloom, they were ominous. They whispered rumors of accidents in the dark.” Just when you might start to feel comfortable, Mr. Sloan whisks you off to the inner sanctum of Google and an underground meeting place for a secretive group of bibliophiles. This book is fun – a lot of fun – and it doesn't take itself too seriously. In spite of that, it manages to bring up some important questions about our seemingly polarized book culture. How does a book lover appreciate both a Kindle and an antique hardcover? Is there a place for the old and the new? So, to bring some sort of conclusion to my four month old ramblings...If you love books about books and a fun story and you somehow haven't read this one yet, get thee to the library and give it a whirl! Why haven't I read this yet? I've wanted to ever since I first heard of it. Ah, there. I've just requested it from my library :) Thanks for the review! I really liked the fact that the title discussed relevant issues. I work in the tech world, so it was interesting to see the stereotypes presented and the jargon spewed. I didn't necessarily love the ending and made this book a little less enjoyable for me. However, I do think it's a great read for book lovers! The glow-in-the-dark cover was too cool. I found the tech parts really interesting. Were they somewhat accurate? Mine didn't glow. :( Maybe because it was the library copy? I was so sad. For the most part it was something you'd hear in the environment; although, a lot of the google stuff was just fiction. Still it made me think about my own office. OH NO! My library copy did so that's really stinks that yours did not! I mean I guess it isn't that cool, just different. Man, I really wish mine did glow. Oh well. This sounds wonderful and I love the title! Thanks for the review. I am prone to letting my reviews build up and then writing quite a few on the same day from my notes. Just seems to happen..! Mine tend to pile up too, but I think it's a habit I need to drop. I don't love looking through my notes trying to figure out what I meant!